01: WHY IS ZONE EFFECTIVE? 1. Any time a defense can force its opponent to run its zone offense; they have achieved a little win. 2. Offenses should dodge against zones, but offensive coaches continue to think a lot of passing is the way to beat it, so they run scripted plays. Really, zones are set up to be in position for quick passes. 3. It gives the chance to play a more help-oriented, packed-in defense rather then find themselves on an island. 4. Committing to a zone D helps a team become much better at the zone and adjustments within it, whereas opponents who only prepare for a week struggle to adjust. A. Where are the Shortsticks? If you number your zone spots 1-2-3 across the top and 4-5-6 across the bottom, a 1-3 Zone puts the shortsticks in the 1 and 3 spots. Other teams like to put the shorts in the 4 and 6 spots, while some might run a 2-5 Zone with longsticks on the corners. Some run a 2-5 Zone, which can be tough to attack with all those poles on the perimeter. Some teams zone kept the 5-man inside at all times, covering the ball-side action and depending on backside players to cover the backside of the crease. Other zones employ the 5-man to “spoke” behind the net when there is an attackman at X, which allows for more of a matchup zone. When an offense is in a 2-3-1, the 5 can play behind the net and the 2 can drop to the crease to match up perfectly, but the disadvantage of the 5-man spoke is that the crease tends to be open more often. The advantage of a matchup zone is tricking opponents into thinking they're playing versus a man-to-man defense. If a defender stays with the ballcarrier and flips positions with the bottom row, (allowing 5 to not only spoke but flip flop with 4 and 6), it can appear like a man-to-man. Since most zone offenses don't move a lot, defenses can have a big advantage playing man against a zone offense. Most zones will pass off wing dodgers because it's more difficult to flip-flop with the 1 and 4 In the case of a dodge or carry of the 4 man up the wing, at some point 4 would let the ball carrier go to 1 and try and get back (scrape) to the vacated area. In a 13 zone this pass off would happen at around 7 yards above goal-line-extended (GLE) where as in a 46 zone, it would need to happen at 3 or 4 yards above GLE. Adjusting where you pass off and how quickly you scrape back, can be a simple adjustment that can really make it tough on a zone offense. F. Adjacent help and rotation. Ultimately, rotating around the perimeter is what some teams do and what most zones do. 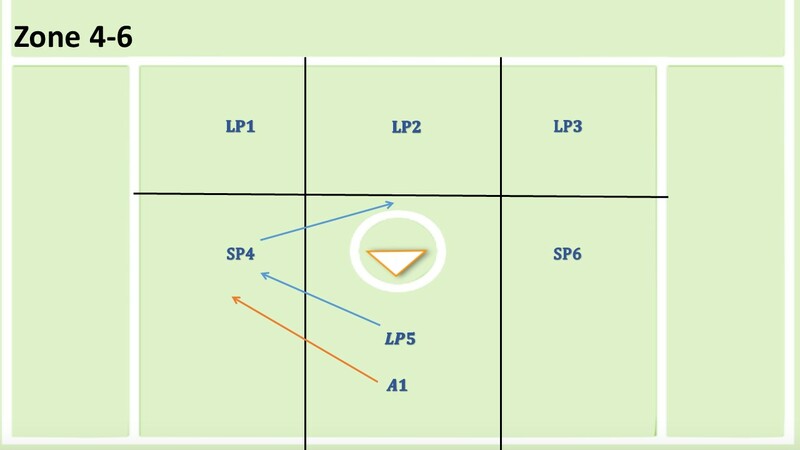 If for example, in a 13 zone, if a midfielder dodges 1 down the alley, 4 would have to slide and 6 would usually rotate over and 3 would rotate down the backside. However, with the "spoke" concept, a zone can always rotate off the crease with the 5 man and let the backside 4 or 6 cover the crease.